Novak Djokovic and Andy Murray will contest the Australian Open for the third time in their career when the pair meet on Sunday to wrap up the 2015 Australian Open Championships. Murray was first into the final with a four set victory over Tomas Berdych, 6-7(6) 6-0 6-3 7-5. After a feisty opening set in which Berdych saved a set point, Murray was pretty pumped up. He cleaned up his game producing 30 winners and 21 unforced errors in the final three sets and winning a higher proportion of points on his second serve. There were some fun moments in this match… Kim Sears managed to make the front page of many British newspapers this morning! Murray’s post-match interview where he discussed coach Amelie Mauresmo was brilliant. In the second semi-final on Friday evening, Novak Djokovic and Stan Wawrinka produced another five setter… however, it didn’t come close to matching the quality of their two previous epics in Melbourne. In fact, the general tennis world was in a state of befuddlement at the match, which was widely labelled as “strange”. In the end, Djokovic won, 7-6(1) 3-6 6-4 4-6 6-0 in three hours and 30 minutes. The stats pretty much tell the story… the pair produced 69 winners to a whopping 118 unforced errors. Like the women’s final, this match-up is not doing much for me. I’ve always struggled to get excited about Djokovic-Murray matches. There has been the odd classic in their previous 23 match-ups; their semi-final at the Australian Open in 2012 was fantastic, finishing with an absorbing final set. Djokovic won the match, 6-3 3-6 6-7(4) 6-1 7-5 in four hours and 50 minutes. Their final in Shanghai in the same year where Djokovic saved a string of match points was also great. In 2014, Djokovic won all all four of their encounters. The three ATP encounters all ended in straight sets. Murray got a set in their last Slam outing at the US Open. For two sets it was close before Djokovic took control of the final two sets to win, 7-6(1) 6-7(1) 6-2 6-4. Of the pair, Murray was much the better player in the semi-finals… but that doesn’t automatically mean that Murray is going to win this final. Djokovic was well below his best against Wawrinka, but he won the match and that’s all that really matters. I would definitely expect Djokovic to up his game for the final. His record over Murray has been dominant of late and although I think it will be much, MUCH closer than their previous matches, I’d still favour Djokovic to come through. I’ll be cheering for Murray though! Poll Results: 57% of readers correctly predicted that Djokovic would beat Wawrinka and 55% correctly predicted that Murray would beat Berdych. January 30, 2015 in ATP, Australian Open, Djokovic, Murray. ← Lucie and Beth win the 2015 Australian Open Women’s Doubles! Unless Djokovic is off his game, I can’t see how he could lose, really. They were fairly close two/three years ago. Murray had the better serve and a wider shot selection, Djokovic was the greater athlete and best returner in the game. Since then Djokovic’s serve has become an absolute weapon and he’s now much quicker in pulling the trigger and getting shorter points by coming to the net. Murray, meanwhile, has become vulnerable because of his serve. Djokovic is not only the more aggressive player, but when it comes down to it, he defends better too. Can’t see how he would lose? But he’s lost to Murray twice in finals of the US Open and Wimbledon so why not the AO? I only just noticed this. Djokovic’s game is entirely different now than in 2012/13, as I already stated in my post. He’s much more aggressive under Becker, more eager to end points quicker and dominate not only from the baseline but inside the court too. 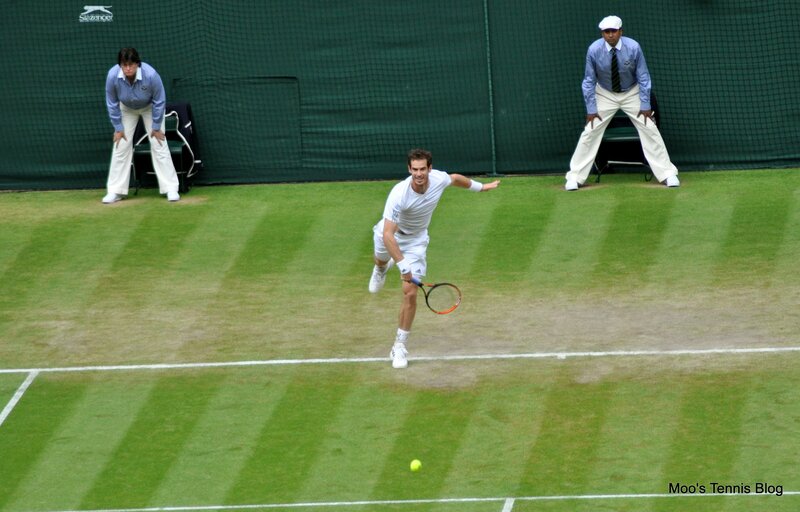 And let’s face it, there was no stopping Murray in 2013 at Wimbledon. Even if Novak hadn’t had to claw his way to the final (he didn’t look remotely like himself), the crowd were willing Murray on and he was never going to lose no matter who was on the other side of the net. The one thing that annoys me about Federer vs Djokovic is that they only ever meet when the former is playing well, because if he’s ever at less than his best then he doesn’t make the semi/finals, whereas even when Djokovic isn’t playing too good he still makes a deep run. Of their matches last year, the only time Federer beat an in form Djokovic was in Shanghai where he took everybody by surprise with how good he played. This AO has been great for me I hope it will end the same, Novak is better almost everywhere, he will show up in a way better form than in the SF and Murray has a problem againt him, I don’t picture him solving it tomorrow. I think people forget that ageing is a problem for all tennis players including Federer, and Nadal. I would say it is no difference for Novak. I don’t think he continue to run back and forth like he was 24 or 25 years old anymore. I think many people think Murray is crap but Murray has much tougher opponents than Novak en-route to the final. In fact. Stan handed the final to Novak with his awful unforced errors. I am not a fans of both players but based on the statistics from Australian Open, I think Murray has his shot this time. I don’t think people view Murray as ‘crap’ exactly, whether they are fans or not! I would say he has a real chance of success here though…. It’s going too be tight – but I think Murray has a real shot at this. Djokovic is very hard to beat when his game is on but Murray is a warrior! Murray will win or he wouldn’t see a title this year. He better take this chance and win. My preview of the final. Do check it out and leave a comment.